The driverless car will never take off because the male ego won't put up with it — Michael's essay: "To the average North American male, the car is symbolic. It may indicate our social, economic, even our professional status. It is also a clear marker of our maturity. Getting a driver's licence at age 16 and a first car a couple of years later was the dream of every teenage male I know." What is meant by "the moral authority to govern"? : As the SNC-Lavalin scandal continues to fester, a growing number of influential commentators and opposition politicians are saying that Prime Minister Justin Trudeau has lost his "moral authority to govern." No one questions whether he has the legal right to govern, given that he won the most recent federal election. Michael talks to political-scientist-turned-lawyer Heather MacIvor and former University of Calgary law school dean Patricia Hughes about the history of rhetoric around "the moral authority to govern", what the phrase actually means, and whether it is applicable to the current situation in Ottawa. Honouring the late Patrick Lane: The award-winning poet died this week at the age of 79. In 2013, he gave a convocation address that blew away his audience at the University of Victoria. A great honking joy! How the majestic trumpeter swan was rescued from extinction: When swan lover Beverly Kingdon and biologist Harry Lumsden joined forces, good things happened. The woman who loved swans and the Ontario wildlife scientist with a cause, have worked tirelessly to bring the largest swans in the world back from the brink. Theirs is an environmental success story. Alisa Siegel's documentary is called "A Village of Swans, A Village of People." Why do we enjoy another's misfortune? 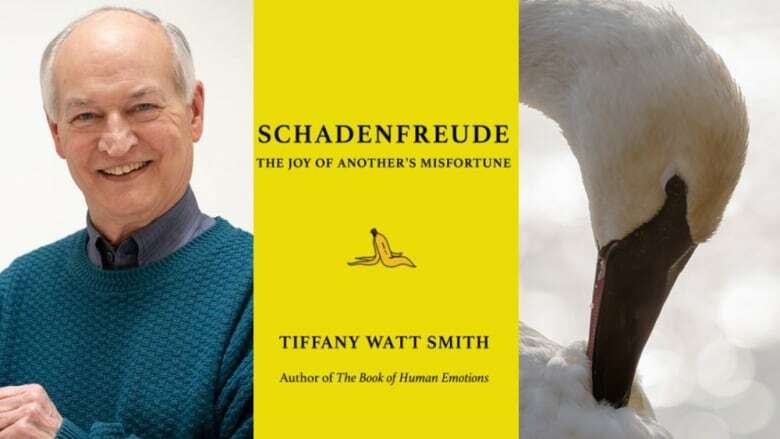 Author Tiffany Watt Smith's insight into schadenfreude: Schadenfreude (from the German word "schaden" meaning harm and "freude" meaing joy) is a universal human flaw we must all face up to if we're going to understand our world, argues British historian Tiffany Watt Smith in her book Schadenfreude: The Joy of Another's Misfortune. The Blue Jays according to Jerry: For 36 years, the affable, supremely knowledgeable Jerry Howarth was the voice of the Blue Jays, broadcasting the story of each game as it unfolded. Now retired, Howarth has written about his life in baseball. The title of his new book is his signature greeting, Hello Friends. Jerry Howarth is Michael's guest. Listeners suggest their favourite 'word jazz' performers: We hear listener reaction to our tribute to "word jazz" pioneer Ken Nordine. Michael's interview with Jack Chambers about Nordine inspired listeners to write to us about other radio performers who were influenced by Nordine, such as Joe Frank, Arthur Prysock, Larry Thor, Al "Jazzbo" Collins, and Canada's own Robbie Robertson. Music this week by: Ofra Harnoy, Miles Davis, Angela Hewitt and Guido Basso.